According Hassan explained to me the Kurdistan is the region located to the north of Middle East, claimed historically by the Kurdish people, the ethnic group which inhabits there. But at the present time it is divided by the sovereignty of 4 countries, and the Turkish side is a completely forgotten area, he told me. When I left the Cappadocia, I asked to Enrico: “which is the least mountainous road to go to Iran”; but the Italian guy who uses to visit Turkey and works in the tourist area, only talked to me about the nicest places in the southeast of the country, and for it, in spite of the fact that I knew that the route which crosses the northeast region is the easiest of cycling; I took the Enrico advices and for it the most difficult option: to “cross the Turkish Kurdistan”. But it was a mistake and it was too difficult, because during more than three weeks I cycled in a mountainous area, where in several occasions the route reaches to 2000 mts of altitude, then it goes down quickly to the 600 or 700 mts and once more it ascends. It was a constant up and down hill, sometimes with big distances between populations and every now and then with some guys who threw me a stone for not stopping to talk with them. It was exhausting, and for moments anti-human. According to explained to me the Kurdistan is the region located to the north of Middle East, claimed historically by the Kurdish people, the ethnic group which inhabits there. But at the moment it is divided in four areas and its sovereignty corresponds to Turkey, Iraq, Iran and Syria. 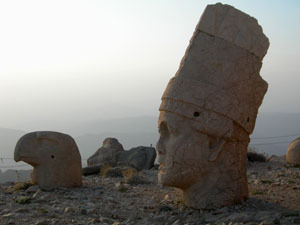 The Turkish part has a very bad reputation, either among the foreign tourists as among the Turks. In more than an occasion I was alerted to not leaving the main route and to not camping in solitude for the risk to be stolen and/or kidnapped. According to some people, three Germans guys who were on holiday in the Kurdistan area were kidnapped by Kurdish rebels just few weeks ago to my arrival of the country. 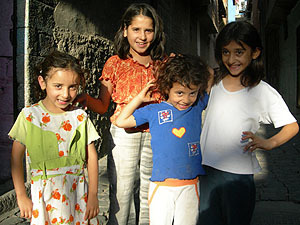 In my journey through the Turkish Kurdistan, I visited Diyarbakir, the city of almost a million hab. which was the epicentre of the Kurdish rebellion in the decades of the 80 and of the 90 against the Turkish government and its army. In 2004 the Kurdish workers party (PKK) renewed their campaign of violence and for it, till today in the whole area of the Turkish Kurdistan a government’s strong military presence exists therefore the relationship between both parts is not still good. For moments I had the sensation that I was in a occupied area, because there were days that I have crossed several military bases with tanks of war, helicopters and big deposits, everything in an area very guarded by soldiers who too young with helmet and machine gun in hand were in a stone guard house behind land bags; as in the war movies. I remember when I crossed a military base where there was a van with at least a dozen of soldiers and after greeting them one run to me to stop me, as if I was a criminal; so I stop and infuriated before he comes close to me I say to him shouting: “What do you happen?”. It was the first time that I was stopped in a control, and the way that it was happening, irritated me. But my reaction was enough, because the soldier and his partners authorized me to keep cycling. Another day, I stopped in other military base to request water to drink, but they were not nice either; they didn’t allow me to come close to the door and they controlled the thermal bottles as if they would have a bomb inside; then they gave me practically hot water, while other soldiers walking around with bottles of mineral water. It was one of those moments that I really wished fresh water. 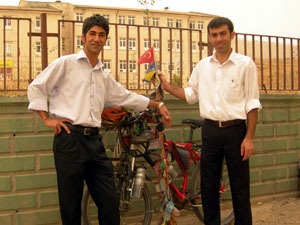 In Diyarbakir I knew Hassan, a 40 year-old guy, 3 children’s father and who speaks 4 languages. According to he explained to me, at the end of the First World War, the Kurdish people supported the Allies against the Ottoman Empire, and for it they achieved by means of the Treaty of Sévres the recognition of the independence of the Kurdistan. However, this international agree was never ratified and it was substituted by another Treaty which distributed the Kurdish territory among Turkey, Iraq, Iran and Syria. 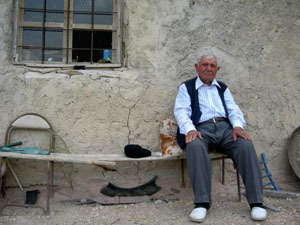 “We are tired” Hassan told me, “the Turks have been taking advance for more than 85 years, but one day it will finish. We also demand human rights. We are more than 20 millions, although the Turkish government doesn’t recognize it, we don’t have a radio neither a television channel, because it is forbidden and only a Kurdish newspaper which is controlled by the government. In the schools one cannot speak the Kurdish language, and the government doesn’t invest in this area, there are not companies and for it, there are not work sources; the Turkish Kurdistan is a completely forgotten area”. The most curious thing was the quantity of children that exist among the Kurdish population; it would seem that if there is not a change, it will be the decisive factor for which the Kurdish people will be imposed to the Turks in the future. During my stay in Diyarbakir I stayed in the Buyuk Kervansaray Hotel which sponsored me with two lodging nights, it is a historical building where in the past the caravans stopped in their journey for the silk route. 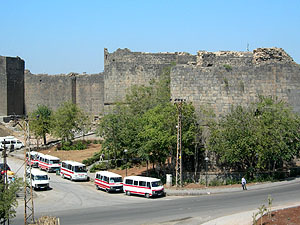 As other cities of the Kurdistan area, Diyarbakir were occupied and disputed by different civilizations, as the Assyrians, the Persians or the Romans, who probably had built the wall of 6 km which still surrounds the old part of the city. I also visited the Ulu Cami, the main mosque built in the XI century and the Virgin Maria’s Church, where Christian families live, although I didn’t like it, because they are more concerned in requesting money than to show the church and its curiosities. During my stay through the east of Turkey I also visited the Monasteries of Mor Gabriel and Deyrul Zafaran, from the Syriac Orthodox Church built in the IV and V century. 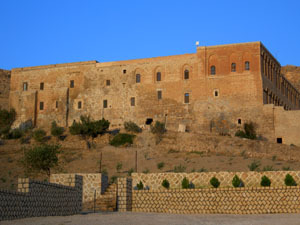 The monastery’s primary purpose is to keep Syriac Orthodox Christianity alive in the land of its birth by providing schooling and ordination of native-born monks. But the interesting thing is that they maintain their own liturgy in Syriac language (Aramaic’s variant, the language which Jesus spoke). On occasions the monasteries have provided physical protection to the Christian population. According to they explained to me the origin of the Syriac Orthodox Church goes back to the I century, being the first Christian church established outside Palestine, it had been founded in Antioquia, (today Turkey) for the apostle Simon Pedro in 34. But in the time it suffered persecutions, as that of the Byzantine Empire because of having rejected the assembly carried out by the Catholic Church in the V century which discussed the Jesus’ nature; or that one by the Ottoman Turks which during and immediately after the I World War forced to the Christians to become to the Islam. In the last decades many Christian families from Turkey were also forced to emigrate. For it Syriac communities exist nowadays in Lebanon, Syria and Iraq; also in the Turkish province of Mardin, in Europe, United States and India. When I visited the monasteries, at once their students received me who mainly are between 10 and 25 years old. Some of them were living there since more than one year, as George or Matias who had their families in the area, while others guys were the children of those people who had emigrated a couple of decades behind, they were studying the Syriac language during some months. I left the monasteries a little surprised, because of I really thought that I would find a monastic life; but with older people. My trip through Turkey kept going to the east, through Mardin, Midyat, Hasankeyf, Batman, Tatvan and Van. It was Ramadan time, for this, it wasn’t easy to find an open place to eat in the noon. So, the option was to stop and to cook something or to accept the invitation from someone who improvised a lunch due to the situation; some bread, cheese, tomato, olives, honey and tea. In some villages there was not even a place to buy something of eating. 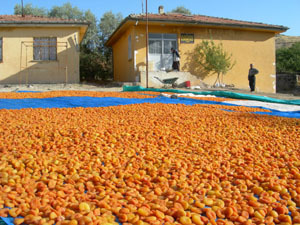 But when I cycled through the Malatya area some people stopped me to present me a handful of dry fruits; till that a man presented me a bag with at least 2 kilos of dry apricot. I didn’t want to cycle heavier, but that good man didn’t let me to take a part of the dry apricot, and I had to take all of them. I also remember to Mehmet, a 34 year-old guy who is a teacher and the director’s of the school assistant where he works, for this he has a good economic position and lives in a nice apartment, although I was surprised when I took a bath, because there was not shower in his house. The teacher also told me about the situation in the Turkish Kurdistan, till late night. It is hard to believe it, but sometimes I rest more in the tent than when I am invited to sleep to a house. 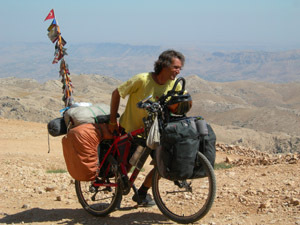 Although the wind and the noises of the place don’t always let me to sleep well, thereby, sometimes I have to get up more than once to be sure that there is nobody around; because of every time that I camp the baggage is on the bike. Once in Hasankeyf, in the middle of the night a dog came close to the tent and it began to bark; for a long while, it didn’t even breath only it barked me, so I had to get up and to improvise: “frighten it off and to throw it stones”.